While previous releases from Universal Orlando have cited roughly an hour’s worth of entertainment from the moment visitors step into Hogwarts Castle in the Wizarding World of Harry Potter addition to their Islands of Adventure theme park, the actual Harry Potter and the Forbidden Journey ride portion of the attraction is now revealed to last around 4 minutes. 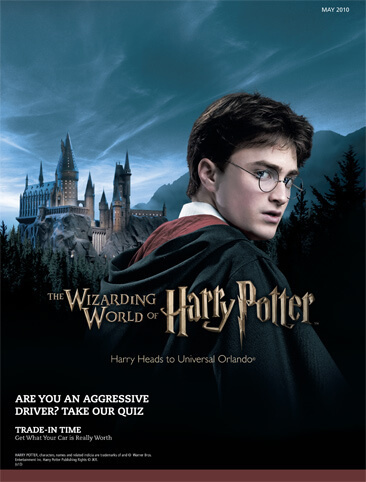 This number was included in an article in the May issue of AAA New York Car and Travel magazine, as part of a larger look at the Wizarding World. The Harry Potter and the Forbidden Journey ride will begin when guests take a seat upon an “enchanted bench” that will whisk them away through memorable scenes from the Harry Potter book and movie series, including a Quidditch match, a trip through the Forbidden Forest, and more. Other interesting new Wizarding World details in the article include the fact that Moaning Myrtle will make an appearance and that the Ollivander’s Wand Shop that will be found within Universal’s version of Hogsmeade Village will be a “branch store,” as any die-hard Harry Potter fan will tell you that the “real” shop (as described in the books and depicted in the films) is located in Diagon Alley. The Wizarding World of Harry Potter will have its grand opening on June 18, 2010. So claim the 56 minute long line you’ll be waiting in is part of the attraction time? brilliant! In all reality, the pre-show sounds just as interesting, if not more so, than the ride itself. The rooms you’ll pass through in Hogswarts Castle sound quite entertaining. Well of course the olivanders wands store is a branch store… We’ve read in the books and seen in the movies how wands get broken, who else would be perfect to repair them other than olivanders. There is a part of me that is starting to worry that The Wizarding World of Harry Potter might not do the books/films justice. I sure hope I’m wrong, but I’m just worried is all. I have to say my excitement level keeps going down the more I hear and see. I hope I am wrong also. June 18th ?! thats when Toy Story 3 comes out, how ironic!